Veteran runs using his heart, not his legs, to finish race. 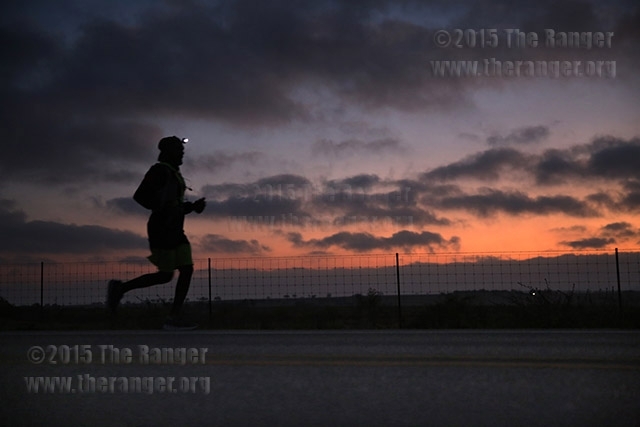 Kinesiology sophomore Roel Gonzalez completed 112 miles of his 223-mile journey, but that doesn’t mean he did not achieve his goal. He set out to raise awareness for veteran suicide by running the 223-mile Capital to Coast Relay Oct. 14-17 as a solo runner, and he accomplished his mission. His family is proud of him. “It makes me proud he is trying to help others achieve what he did,” his father, Sal Villegas, said. The build-up to the race didn’t come without setbacks. Gonzalez’s car was stolen from his apartment complex the day he started the race. His shoes, the two pairs he had already broken in for the relay, were stolen with his car, but he wouldn’t let the theft thwart him from beginning his mission. “I don’t run with my legs; I run with my heart,” Gonzalez said. It wasn’t all joy, though. He was struggling on a dirt road outside of Stockdale when he found motivation from an unexpected source. Around 5 p.m. Oct. 16 Gonzalez was greeted by a man and three boys on horseback — Stockdale locals Victor Mercado, 45; Mason Howard, 15, carrying a U.S. flag; Mattheas Mercado, 13; and Liam Mercado, 6, — who learned from a previous runner Gonzalez is a combat veteran. Gonzalez wiped tears from his eyes as Mercado, Mason, Mattheas and Liam trotted slowly behind, escorting Gonzalez to the end of the road. Support even came from emergency services personnel. Wilson County Emergency Services District 3 in Stockdale allowed Gonzalez and his family a concrete patio at the emergency services facility to camp for the final night of the relay. “Anyone who dedicates his life for the service of country, we can help them any way we can,” emergency medical technician Angela Adams said. Gonzalez ran, jogged and walked nearly 107 miles when he stopped at noon Oct. 17 about 9 miles from Karnes City. His sister LeeAnn Gonzalez was sitting in the driver’s seat of her 2008 grey Dodge Charger idling on the side of the road about a quarter mile ahead of her brother when he announced over the walkie-talkie he was done running. She did a U-turn and drove back to meet him. Gonzalez hobbled to his sister’s car, sitting in the front passenger seat. She drove him about 100 miles to Portland so he could run the last 5 1/4 miles of the final leg of the relay and cross the finish line on his own. As Gonzalez crossed the Nueces Bay Causeway, runner Athena Favias of San Antonio caught up with him, said she was proud of him and encouraged him to keep going. “She later told me she had a relative commit suicide and she was proud of what I was doing,” Gonzalez said. Gonzalez crossed the finish line to high-fives, loud cheers and applause — a hero’s welcome — at the beach next to the USS Lexington in Corpus Christi. A line to meet Gonzalez formed as he sat in a lawn chair on the beach. Runner Jennifer Lyons of Georgetown introduced her son Nathan Lyons, 6, to Gonzalez. Raise awareness about veteran suicide: mission accomplished.